The last episode of the first season of Star Wars: The Clone Wars aired in the USA on this day in 2009. The finale was named Hostage Crisis and featured a first appearance from the menacing and cowboy-like bounty hunter named Cad Bane. 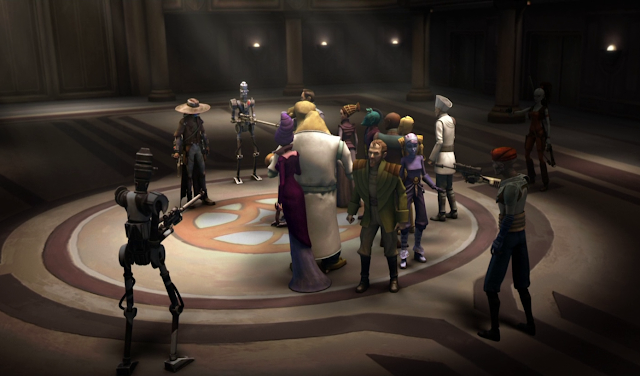 The episode centred around a team of bounty hunters commandeering the Senate building, including a lock down, in an attempt to release Ziro the Hutt from the Republic's prison. Even Anakin Skywalker cannot prevent the hunters from achieving their objectives and Ziro is taken to Nal Hutta and the bounty hunters escape free. What did you make of this episode? Let us know in the comments below.